City officials unveiled more details Thursday behind the massive $400 million development project next to the new Vikings stadium, just over a week before the City Council must approve it. The mayor and developer Ryan Cos. said the deal's 1.1 million square feet of office space represents the largest city office development in 22 years. Wells Fargo's plans to own the property is the largest corporate commitment in city history, they said. The plan also features 400 apartments and about 22,000 square feet of retail. The city component of the package involves borrowing about $62 million to fund a public park and part of a new parking ramp, all on land currently owned by the Star Tribune. The bonds would be repaid with parking revenues from the new ramp and an existing underground one next to the Metrodome, backed by a guarantee spanning at least 10 years from Ryan. The Minnesota Sports Facilities Authority, which is overseeing stadium construction, will pay for about 35 percent of the ramp. The authority will also pay $10.7 million to construct skyways. The largest remaining obstacle appears to be Wells Fargo's insistence on having their bright red and yellow logo atop the office building, prohibited under city ordinance. The Vikings oppose this because of a potential detrimental effect on selling stadium naming rights. An amendment to the city's zoning code would be required for the signage, city staff said Thursday. "It's an important issue for Wells Fargo that has to be resolved before they'll make a final commitment to moving forward," said Ryan Vice President Rick Collins on Thursday. Rybak supports the signage proposal, but when it will be settled remains unclear. The council's final meeting of the year -- before seven new council members take office -- is next Friday. Collins said Wells Fargo could ink a deal contingent on the signage passing, which city staff said could occur in 2014. The park will span approximately one and two-thirds blocks, with the remaining third allocated to Ryan for residential development. The city will own it and pay for its operations, a responsibility Rybak would like to see contracted to the Park Board. Fundraising will be required to support those costs, Rybak said. Much of the $18 million in city funds allocated for the park will pay for site acquisition and demolition of the Star Tribune building. About $1.1 million will be left over to build a very basic park. The Vikings have agreed to pay $1 million for improvements. Rybak said he hopes that the park eventually features a playing field and other amenities -- such as a possible restaurant -- that will attract visitors. He said it will also be a "front yard" for the new residential properties. "This is a place that I hope will be very active," Rybak said. 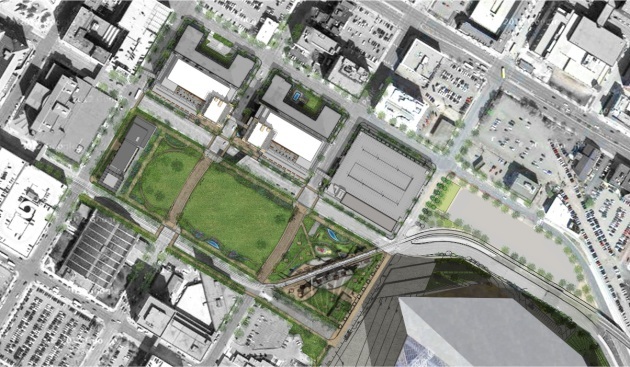 One hiccup in the vision for the park has been Park and Portland Avenues, which intersect the two blocks but won't be closed after objections from key officials at Hennepin County. The county owns the streets. A city staff report says they may be instead "redesigned to be narrowed and have a more 'park-like' feel." "I believe Park and Portland are way too big...We have many examples of roadways that go through parks, but they don't look like Park and Portland do today," Rybak said. The city is also expecting to make money from selling the development rights atop the new parking ramp. As soon as the plan is passed, they will seek proposals for that space so the ramp and development can be developed in sync. Asked whether building a major parking ramp next to the future intersection of several transit lines represents a clash of urban visions, Rybak observed that the stadium bill required 2,500 parking spaces near the new Vikings stadium. "Those ramps were going to be built anyway as part of the stadium. The only difference is we've used them to leverage the" largest corporate office commitment in city history, Rybak said. "My strong advice to the council members and mayor who are continuing is to put tight restrictions on parking in that area, to create the walkable district that we want," he added. "It's already very transit oriented." Collins would not say what price they were paying for the Star Tribune land. Previous estimates from city staff showed it would net the company about $38 million. The plan will go through several committees next week before expected approval on Dec. 13, the final city council meeting. In addition to approving the project itself, the council will need to override a decision by the Heritage Preservation Commission to stop demolition of the Star Tribune building.